At first it was an okay car. I eventually grew attached to it, having one gripe that all my other cars have had; no cruise control. However it was very great on gas. 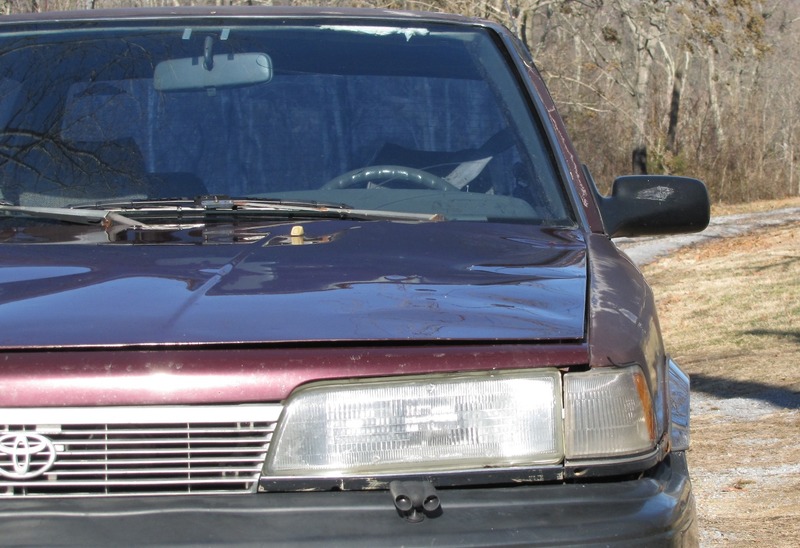 Orion averaged approximately 30 miles per gallon all around. However it was a bit underpowered. And also had an alignment problem, something that was never fixed during my ownership. Orion back in 2006, long before its hood got dented in. With my brief entry of “custom car parts” after following my cousin, Orion received an “upgrade”; a tuner-grade air intake. My horsepower jumped up a little bit, giving me faster take-off. The great thing? Still kept its 30 MPG rating afterwards. I was more than pleased. On a cosmetic note, I had also given it a blue interior paint job on the black molding for effect. One particular thing I remember was the emergency seatbelt release lever; this I had painted orange and yellow as a real ejector seat handle in a fighter jet. 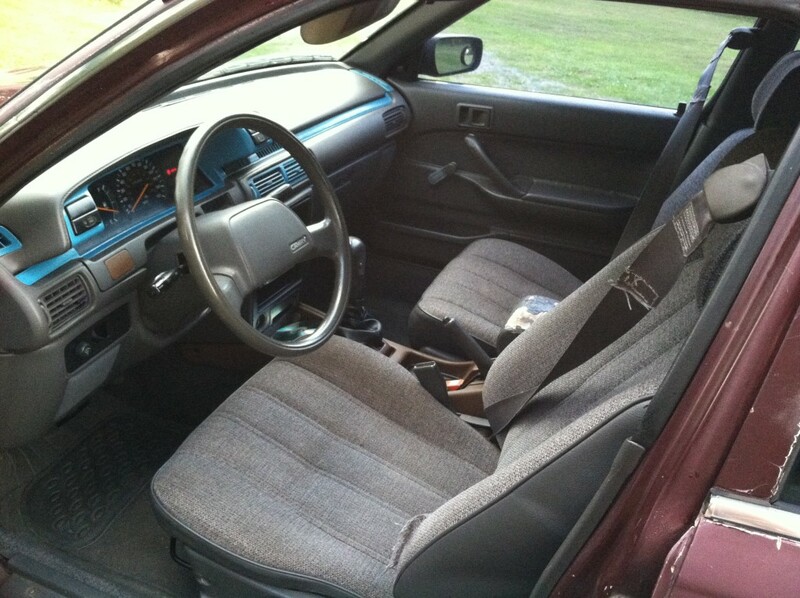 Shot of the interior shortly before I sold Orion in 2012. You can see the blue trim and “eject handle” that I had painted orange on the center console. Brown pieces are parts cannibalized from the luxury Camry I had ran across. Also after the fiasco with the car crash, my parents purchased a CD player for the car as an “incentive” for me to drive it more often. The thing even had a remote. This was more than reasonable for me. It was still a 4-cylinder Camry but after those tweaks it was my go-to car. My pride, the unit I’d take out on my sorties to Walters State and anywhere else I needed to. Many of my classes were at night-time in my first two years of school. Weekly nights were spent on I-40 heading back home, the soft green glow of the instrument panels illuminating the interior of the car. I thankfully had a CD player, sprouting tracks from the Megaman X series and newly-discovered J-Pop artists such as KOTOKO and Ayumi Hamasaki. Orion racked up a lot of miles, especially Interstate distance. It was the car that took me on my first solo trip out of state. I used it to attend Animazement both times in 2008 and 2009. Orion was my literal symbol of freedom, able to go anywhere in a 250+ mile radius to visit anyone or attend any event on a whim and at a cheap price. Except for the tire issue, a bad CV axle and a constant misaligned front end, the car was solid and rarely needed any maintenance except a new battery, oil changes and an alternator. 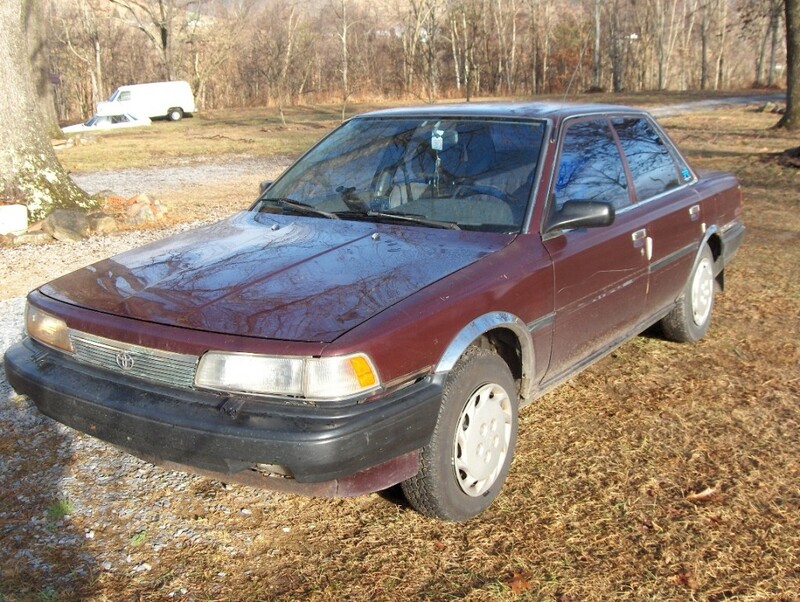 Around 2010, I had received my uncle’s 91 Camry for salvage. The car never worked and had an issue with starting, so I swapped some of the parts out from the “luxury” model onto my base frame. The biggest things were the ECT switch (Electronic controlled transmission) and partial installation of the cruise control system. I never got this to fully work as I couldn’t recover all the wiring, but I did but the vacuum module in along with the cruise control switch. Neither the ECT or the cruise was functional, but hey they plugged in and lighted up when I did! In 2012 of my second year of attending ETSU, Orion developed an issue with the starter. The cause of the eating tires out was determined as well; the ball joints and rubber bushings to hold it in place had deteriorated. It was eating up new tires yearly at this rate, the car always pulling to the left. Orion in 2012. By now all the hubcaps were gone and the paint was starting to deteriorate, especially on the trunk. I had been driving the car for 7 years, wanting a new ride. Dad didn’t find the parts and it was deemed too expensive to fix. I sold it to a guy later that fall and received a Jeep Grand Cherokee which I drove for the remainder of my tenure at ETSU. At the end of its entire service, I had an ending mileage of 204,600. Two weeks before my graduation I was sitting at Starbucks in Johnson City, sitting outside and working on a personal journal. A smell and a small gust of air hit me, bringing me nostalgia of cruising down the Interstate at 70 with a certain Toyota Camry, on an adventure long away from home. This was not something I could’ve with my current Jeep (christened Vesuvius). A gas hog, stuck in 3rd gear due to a transmission problem and having no radio, speakers or even A/C. It was just a big hulk to take me around the block from home and school. Since I had given up Orion, I have never ventured far from home unless it was a family trip where they rented a car. For that brief moment, I missed Orion. 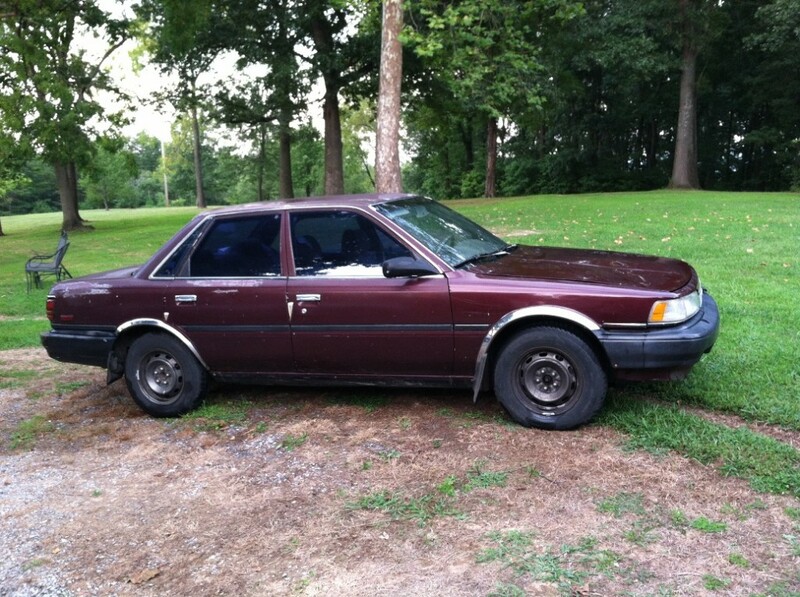 The rugged burgundy sedan that gave me wings to see new things. And that freedom attached to it. That same evening, that same moment, I vowed to have that freedom once again. I still drive a Grand Cherokee (a different Jeep, same model and year). I know it will happen when I will take to a newer vehicle that will allow me to go afar once again without worry. Time will tell when. **A little subnote that deserves its own few paragraphs, hopefully explaining a few things. I was a big Star Trek fan when I was younger, still am to a degree. I had all sorts of unusual ideas and creativity. One of these was designating cars with “names” and even a registration number. I grew out of it for the most part, but I have and always name my cars since. The naming convention is fairly open, but of now, it follows names of cities, landmarks and constellations. Sporty, capable cars that were akin to a “fighter” sometimes carried a different moniker, something special (Nighthawk, Novastar, etc). More standard cars would be named after US cities or a global landmark with sometimes a Latin twist on it (Atlantica, Lexington, etc). For my last two Jeeps, both are named after volcanoes (Pompeii and Vesuvius) on purpose as both are huge gas-burners, big and boisterous than my previous vehicles. So a purpose is usually given along with the name. So that concludes storytime today. There’s probably a lot of other stories out there about how a car meant something to someone, so I contribute towards that with my own.